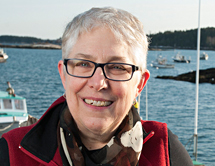 Robin Alden, is the Founding Executive Director of the Maine Center for Coastal Fisheries (MCCF), Maine’s center for coastal fisheries based in Stonington, Maine. She co-founded the organization in 2003 with a vision of collaboration—doing the education, collaborative research and policy to bring together the knowledge and expertise of fishermen, scientists, and policy makers in the shared management of Maine’s coastal fisheries. MCCF's focus is the most fishery dependent area of New England - the 150 miles of Maine coast from the Penobscot Estuary, east to the Canada’s Maritime Provinces and it works at state, regional and national levels to achieve its goals. Robin credits the urgent threat of climate change as an ironic motivator for spurring local, state and federal regulators to adopt new, more collaborative approaches to managing fisheries that include local fisherman and their unique knowledge in making tough, informed decisions. Under Robin’s direction, MCCFs innovative approach is internationally recognized as a model for sustainable fisheries. Robin has pursued this vision throughout her career: founding a regional fisheries newspaper, founding and running Maine Fishermen’s Forum, and as Maine Commissioner of Marine Resources. She is a recipient of the White House Champion of Change for Sustainable Fisheries.